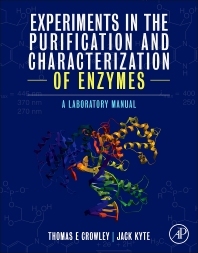 Experiments in the Purification and Characterization of Enzymes: A Laboratory Manual provides students with a working knowledge of the fundamental and advanced techniques of experimental biochemistry. Included are instructions and experiments that involve purification and characterization of enzymes from various source materials, giving students excellent experience in kinetics analysis and data analysis. Additionally, this lab manual covers how to evaluate and effectively use scientific data. By focusing on the relationship between structure and function in enzymes, Experiments in the Purification and Characterization of Enzymes: A Laboratory Manual provides a strong research foundation for students enrolled in a biochemistry lab course by outlining how to evaluate and effectively use scientific data in addition to offering students a more hands-on approach with exercises that encourage them to think deeply about the content and to design their own experiments. Instructors will find this book useful because the modular nature of the lab exercises allows them to apply the exercises to any set of proteins and incorporate the exercises into their courses as they see fit, allowing for greater flexibility in the use of the material. Written in a logical, easy-to-understand manner, Experiments in the Purification and Characterization of Enzymes: A Laboratory Manual is an indispensable resource for both students and instructors in the fields of biochemistry, molecular biology, chemistry, pharmaceutical chemistry, and related molecular life sciences such as cell biology, neurosciences, and genetics. Does FNR Function as a Monomer or a Dimer? Do FNR, LuxG, and LDH Have Different Michaelis Constants for NAD(P)? Thomas Crowley studied biochemistry as an undergraduate at the University of Illinois Urbana-Champaign. He then pursued graduate studies in molecular biology in the Division of Biology at the California Institute of Technology. As a graduate student and later during postdoctoral studies he used biochemical and genetic methods to examine the regulation of gene expression and the intracellular localization of proteins during animal development. He has taught courses covering a wide range of chemical and biological topics such as general chemistry, biochemistry , microbiology, cell biology and developmental biology. These courses were taught at Montclair State University in New Jersey, Columbia University in New York City, the University of California San Diego and National University in La Jolla, California. He has authored articles derived from his research in a variety of journals and articles derived from his teaching in Biochemistry and Molecular Biology Education (BAMBED). He is currently an adjunct faculty member in the Department of Mathematics and Natural Sciences at National University and a member of the American Chemical Society. Jack Kyte graduated from Carleton College in 1967, completed his doctoral studies at Harvard University in the laboratory of Guido Guidotti in 1972, and was a postdoctoral fellow with S. Jonathan Singer at the University of California at San Diego. In 1974 he joined the faculty of the Department of Chemistry at the University of California at San Diego and retired from the department as Professor of Chemistry in 1999. In his research, he studied the structures of Na+/K+-exchanging ATPase and anion carrier using chemical labeling and site-directed immunochemistry. He also studied the mechanism of the activation of the receptor protein-tyrosine kinase for epidermal growth factor and the mechanism of the reaction catalyzed by ribonucleoside-diphosphate reductase. He has written two books, Structure in Protein Chemistry and Mechanism in Protein Chemistry.